Photographic emulsion to produce precise and repeatable prints. 10 more ways to use your screen, if you’re not feeling too precious about the mesh! Learning the basics and falling in love with felting. Nuno felting with fabrics included in the felt. Jewellery, includes felt beads, rope and small amulets. Natural dyeing, bubbling pots of plant matter to bring out your inner witch. Screen printing with thickened dyes, then steam the results. Free form lap loom weaving is so HOT right now. Even HOTTER is the knotting fun of macramé, make a wall hanging, plant holder or owl. Form the sculpture from wire, newspaper or mesh and coat with paper mache or plaster bandages. Appliqué, found objects stamping, roll, rub and splatter on fabric. Make wings or hats or an outfit out of recycled materials, ideal for groups performing, carnival processions or parades. Soft sculpture made with fabrics and stuffing. 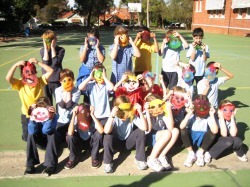 Ragdolls from recycled materials with painted paper mache heads. Throughout the year I teach adults, weekend and night classes and the kids school holiday program here at the Fremantle Arts Centre.